This is a 7.3% ABV IPA and has a suggestively sinister name with a creative box-art and label. Look-This IPA pours a light yellow with pretty clear clarity and a thin foamy white head. Smell-It smells really fruity and juicy! I get pineapple, tangerine, and mango. Taste-I taste the natural hop essences such as pineapple, tangerine, citrus zest, mango, and other juicy and fruity flavors that were apparent on the nose. It has a subtle bitterness to it, but it is all well-balanced. The malts are sort of like a honey-suckle which is a delicate and delicious malt-backbone and is a nice change of pace from the sort of caramel malt background in average IPAs. Overall- Like the namesake of the beer suggests, there is such a delicious and well-balanced flavor here that you’re almost ruined for the average IPA. This may be my new go-to beer for a while. Cheers! A little more bitter than I'd prefer for a good hoppy IPA. I’m so excited to try this iconic IPA. Pours a bright golden yellow color with an off-white head, just a gorgeous beer. The nose is dank citrus and some pine. The dank citrus is forward on the taste, but the pine is also prominent. This is a superbly balanced world-class IPA, IMHO. This was rated after I had just finished a Pliny the Elder so it may have been a little higher on a fresh pallet. Wicked Weed's Pernicious is listed as one of the 50 best IPA's in the country--and the best in NC. While The PubScout is not usually a subscriber to any "best of" lists (beer drinking is so very subjective and there are some exceptional IPA's out there from every state, including NC), I will not take issue with Food and Wine's choice here. 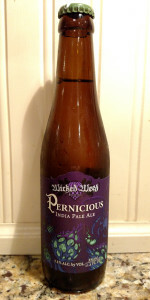 Pernicious is a damned fine IPA, as well as a wonderful example of the style. Lovers of Haze/Milkshake-Bombs will likely not be as impressed, but that's their problem. Perfectly balanced between a few varieties of hops and Malts, true IPA lovers like Der Braumeister Hoffmann in Roselle Park will appreciate the craft here (even though WW is now owned by AB). Not a Brit clone by any means, this is an American IPA though and through, and apparently perfectly centered between a West Coast IPA and an NEIPA. And I can attest it's even better on tap directly from the Asheville Brewery. S- very fruity, mostly pineapple with some sweet hoppiness. I get a slight orange smell. T- this is my favorite tasting beer, bar none. Wicked weed hit the bullseye on this. It is initially fruity with pineapple/tangerine to begin. Then i taste the beery, malty flavors with perfect, slight bitterness on the finish. It is just delicious. Overall this is the prime example of what beer should be, and just about the best ipa that money can buy. If i could afford to pay the $9 per 4pk or the $12/6pk of cans that is available here in the triad in NC, this would be all I drink. Until then, this is the best beer for celebrations or when I really need a dang good beer. Cheers! Was sitting at the bar puzzling over a known entity, Ipswich 1A, or this thing. All I can say is that NC beer folks skewed the tastes. It’s ok. I mean, I will finish this draft. But a 4+ average? Yikes. I’m happy to live in hazy ipa country is all I can say. I’m not trying to bust chops on this beer. It’s okay. It ain’t a 4 in mass and Vermont.